One full week working on my own on the feld, and I figured if I did 25cm each week then I could finish in 6 weeks. 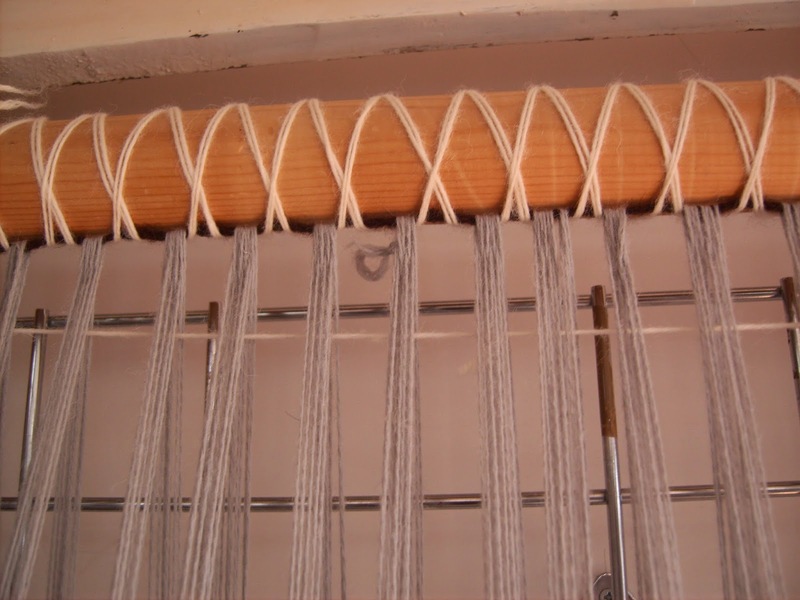 For the first week - I failed, only 15cm have been woven. I will have to play 'catch up' this next week to get on track. I will have help one day from Mary, as pay back for helping to 'roo' her rams. 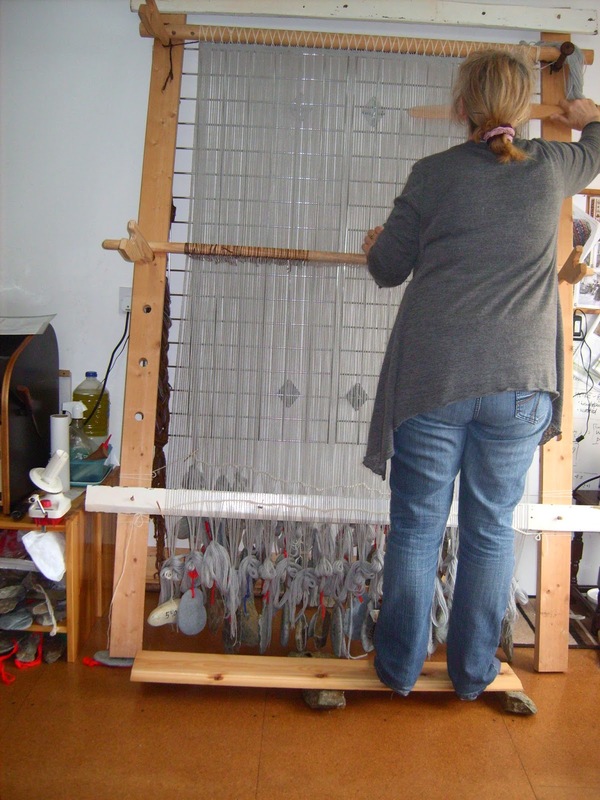 That could be a whole day of weaving, and with the 2 of us working I might be ahead of schedule after that. 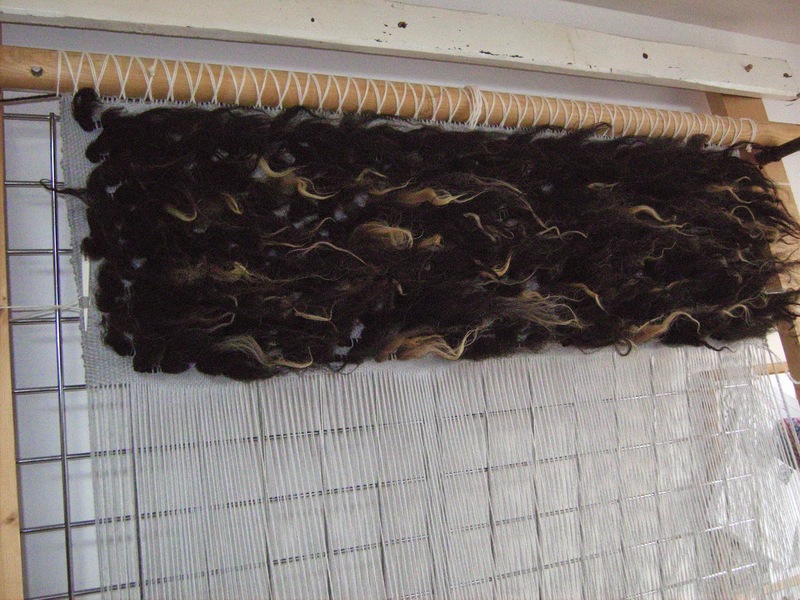 15cm woven on the 2nd quarter of the feld, with a colour change - very light grey with a little black and dark grey. A question was asked regarding what a Vararfeldur is exactly. It is a Viking age cloak, the word means a cloak which is a sale item. 'Vara' is where the English word for 'wares' comes from - sale goods. 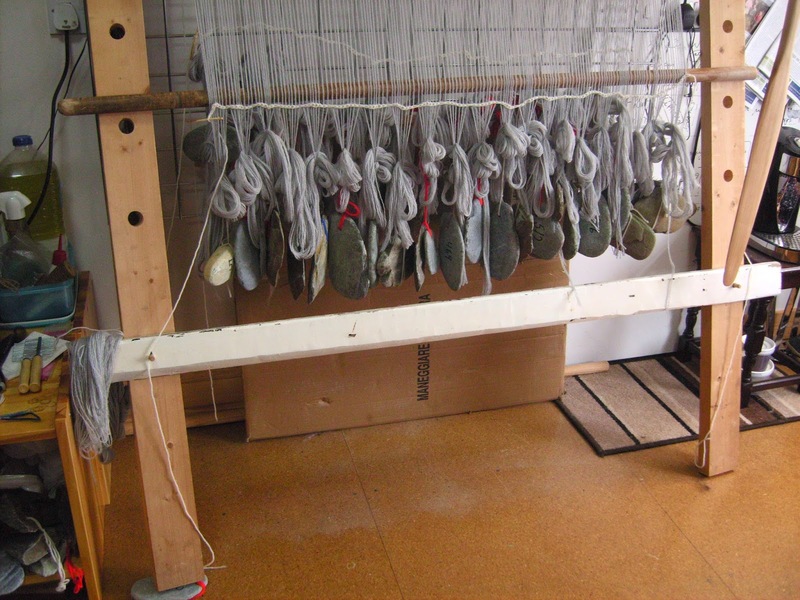 They were made in Iceland, mainly around the 12th and 13th century's, and many being sold to Norway. 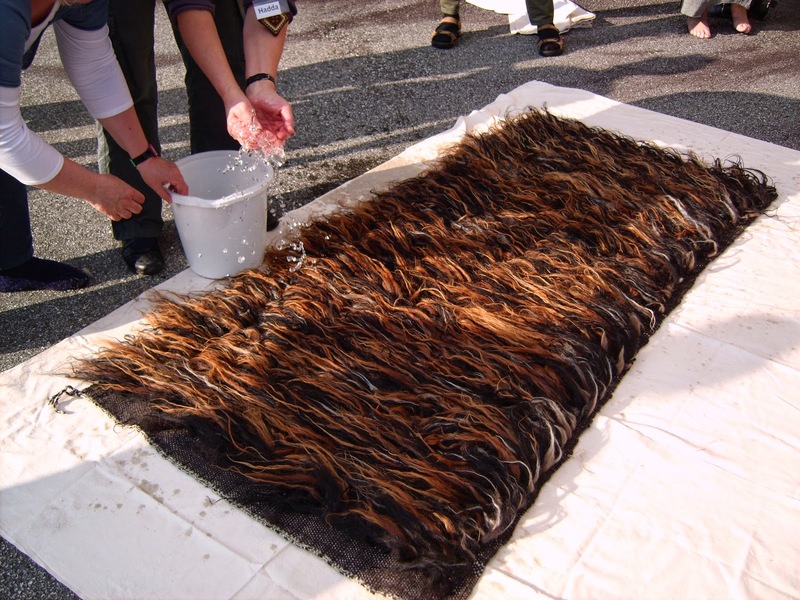 The Icelandic fleece is perfect for the tufts on these, and as the Icelandic law book, which still exists, documented much of the textiles which were made, we have a good description of the details of the cloak. 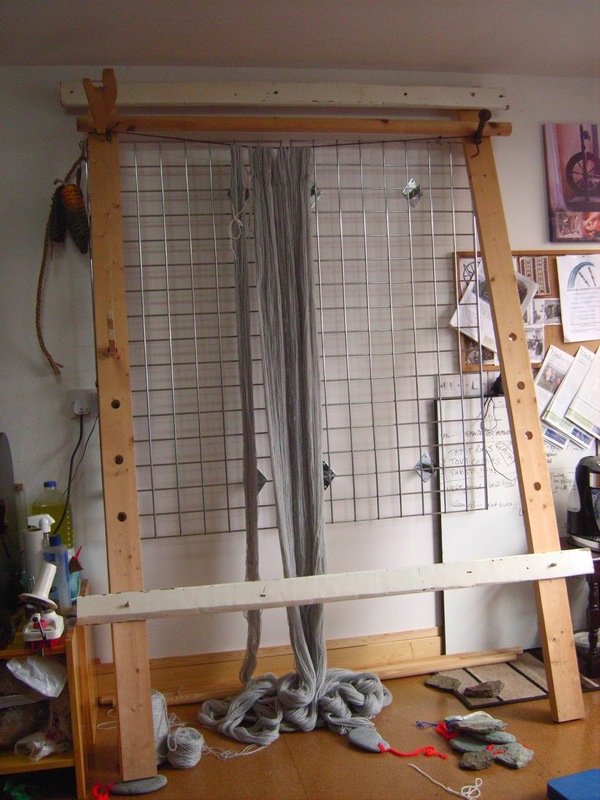 It measures 1 metre by 2 metres (approx, in today's measurements). 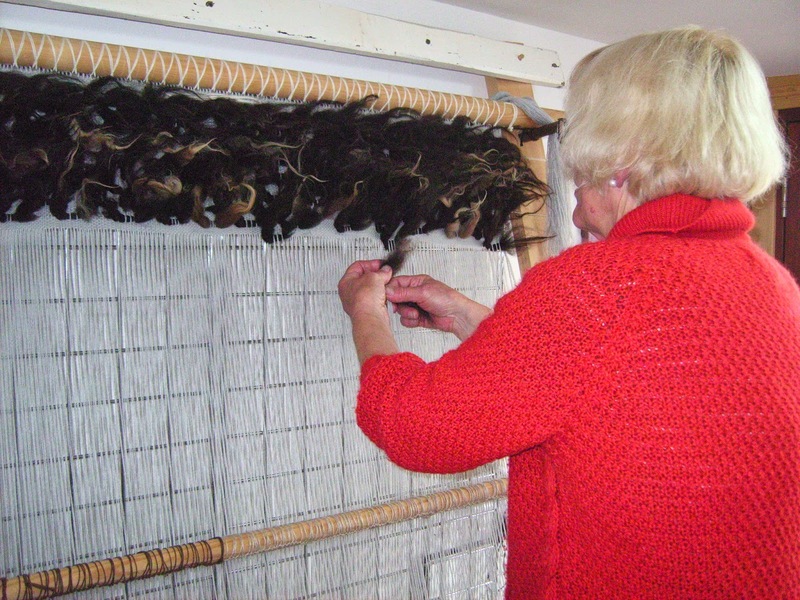 There are 13 tufts in every row. 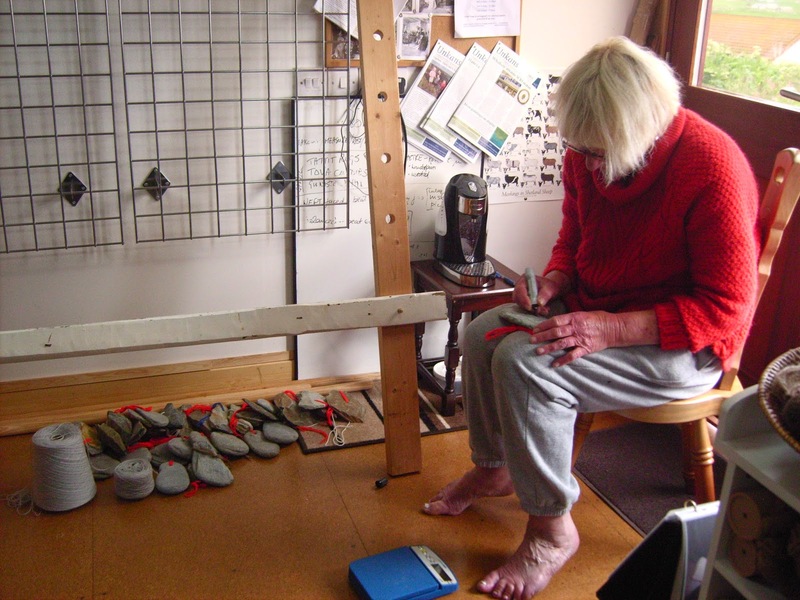 There is a piece surviving in Iceland where we can see the thickness and set of the backing, and as the 'knot' has been analysed and documented, we have all the information needed to reproduce the Vararfeldur. The finished item mimics a sheep skin, but is a larger piece, and so works as a cloak which easily wraps round the whole body. It will stay as a soft fabric where a skin may become harder in time, will be easier to dry when it gets wet, but will keep the wearer as dry as a skin does. This is a Vararfeldur which we made in Norway. 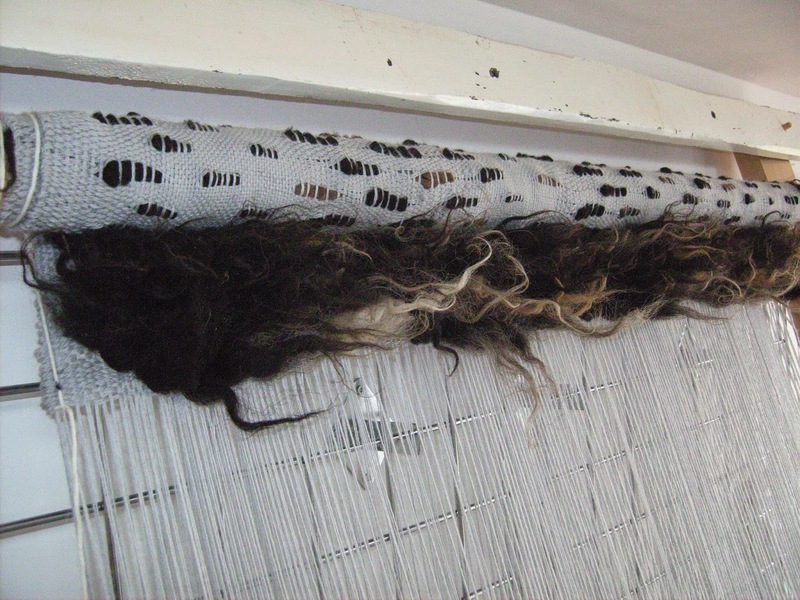 You can see the tufts all lying in one direction - from the top edge of cloak to the bottom. To finish it we took it outside, (laid it on a sheet), wet it and walked on it. No other washing or finishing was done, but it worked well. 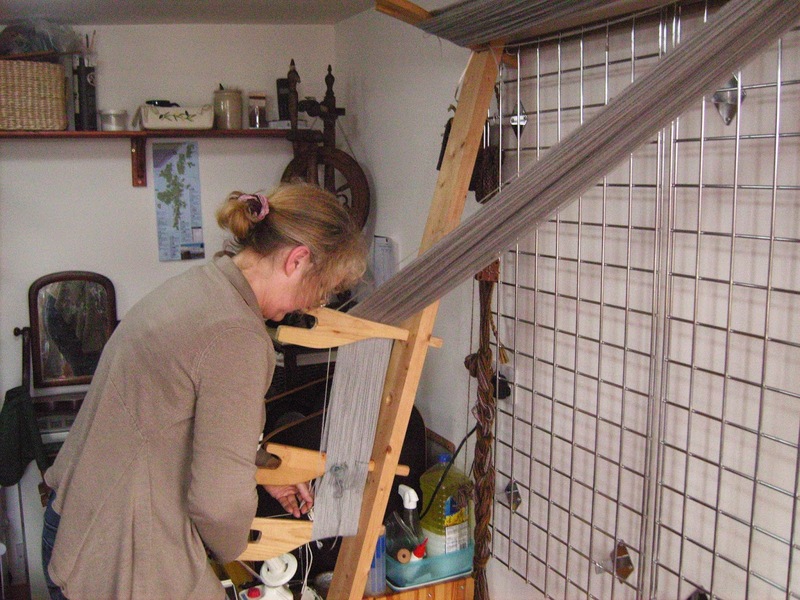 Sigrid went home today but we did take time to roll the weaving up on the top beam before we went to the airport. 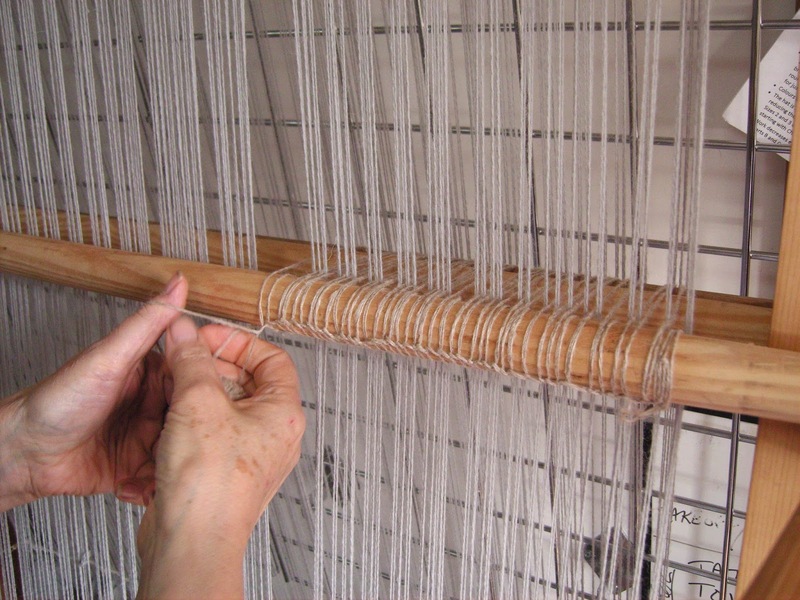 With the weaving rolled up the loom, the stones needed to be lowered. 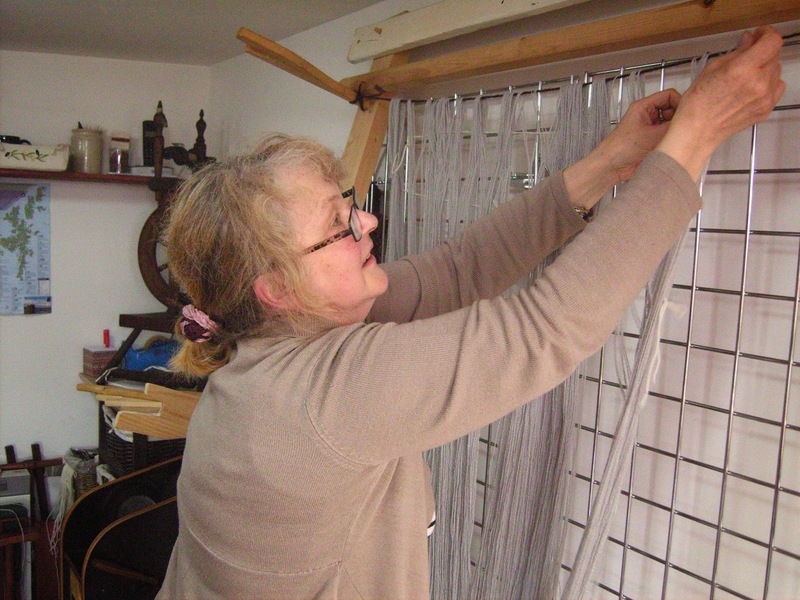 My shed rod is fixed and quite low, and with the distance the weaving was rolled up, I needed to put a spare heddle rod in place to hold the shed until the stones were lowered. You can see the fluff from the yarn on the floor - maybe should have swept that before I took the photo. But also, you can see the cardboard we set behind to lessen the damage to the wall - the stones were really hitting the wall hard at times! 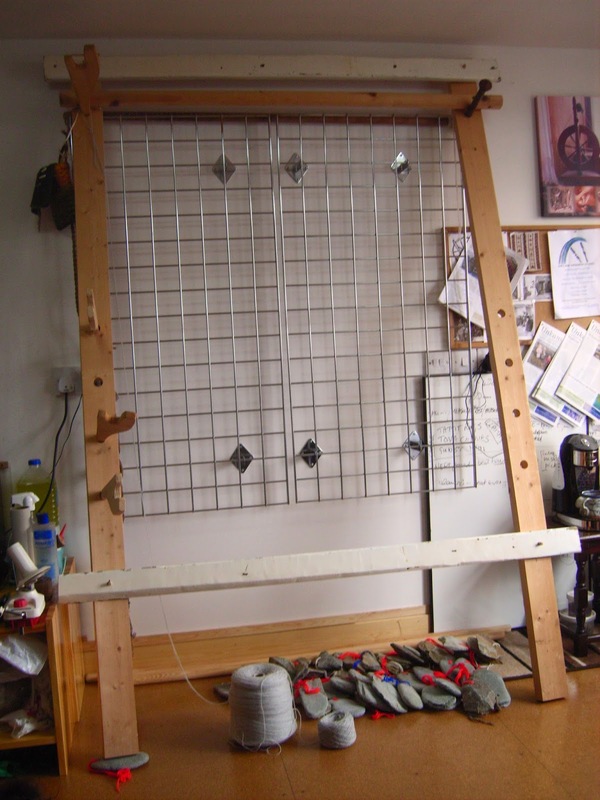 Stones lowered and board back in place, raised on some books, so I can reach the weaving which is now at the top of the loom. A good use for encyclopedias and catalogues. 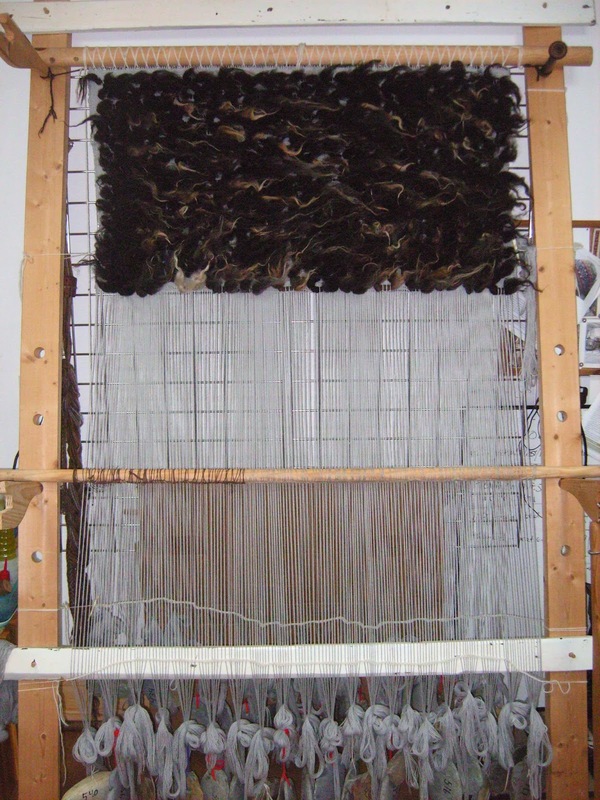 All ready to weave again, but then I decided to rethink how I put the colours in to the next 3/4 of the weaving. 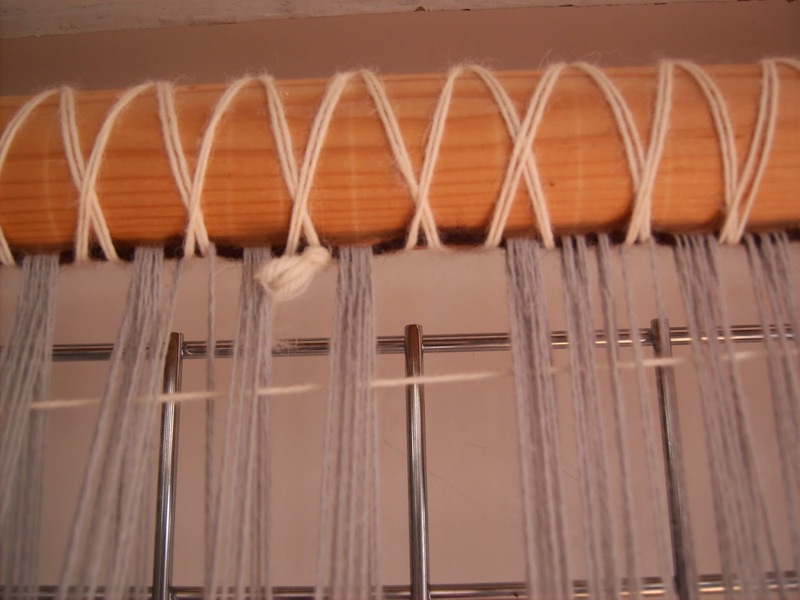 So the weaving will wait until tomorrow. I will also need to prepare more fleece. 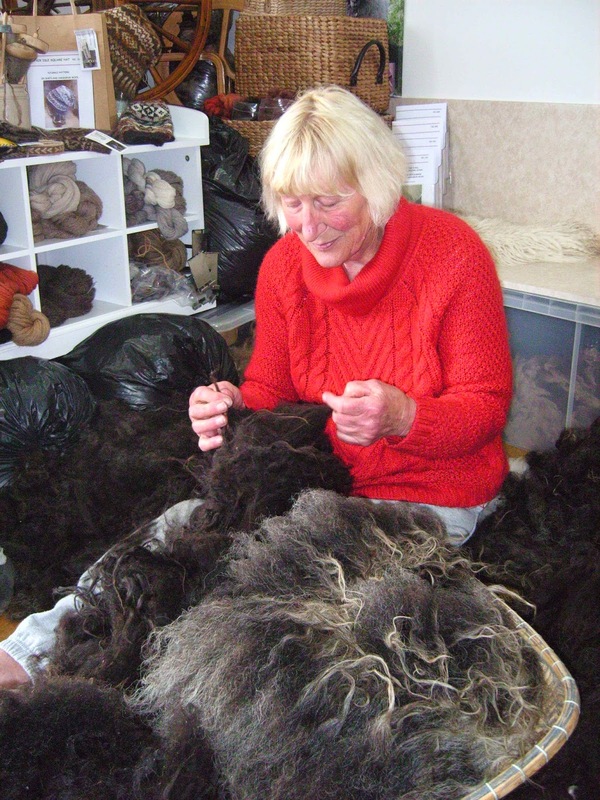 Although Sigrid prepared a lot of fleece yesterday and left a quite a bit of fleece ready to go into the Vararfeldur, it gets used up very quickly. 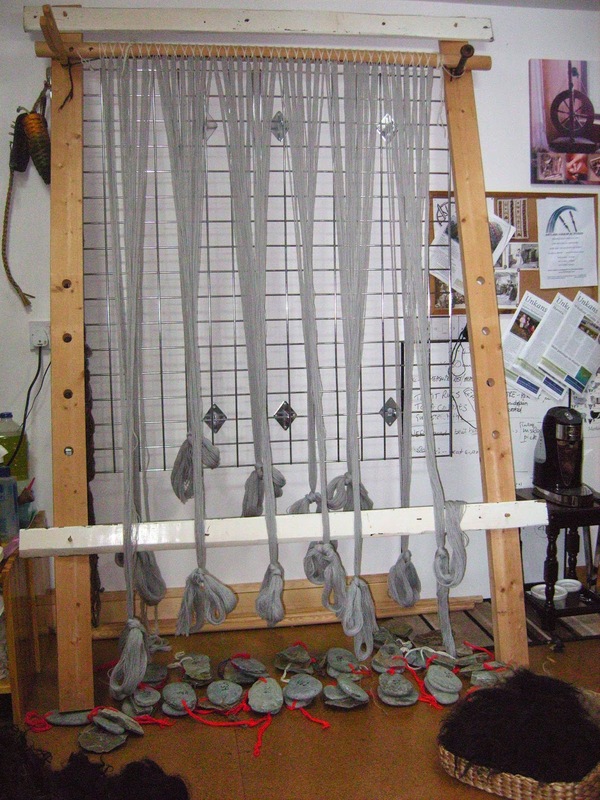 There is black, moorit, dark grey and fawn ready to use, and light grey and white to work in as well. Progress will be slower now, so will blog perhaps once a week from now on. 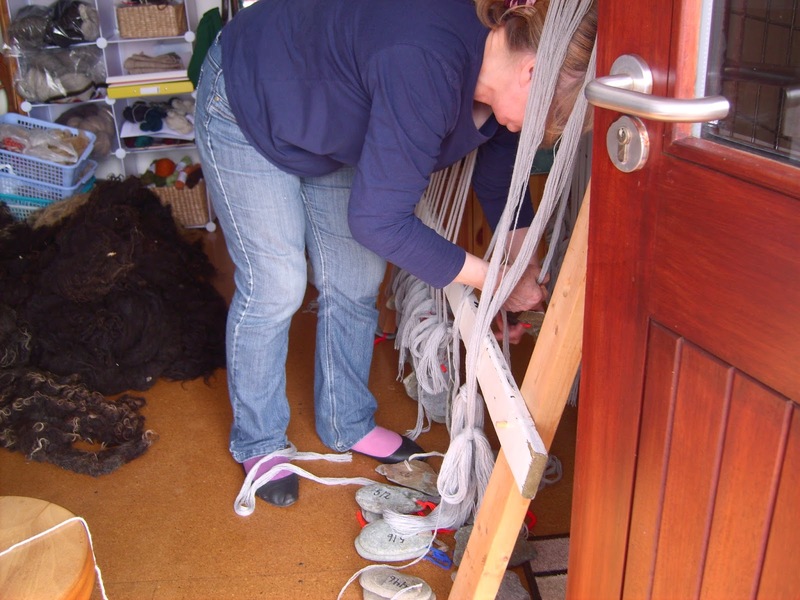 From now on we will be continually preparing the fleece and weaving. 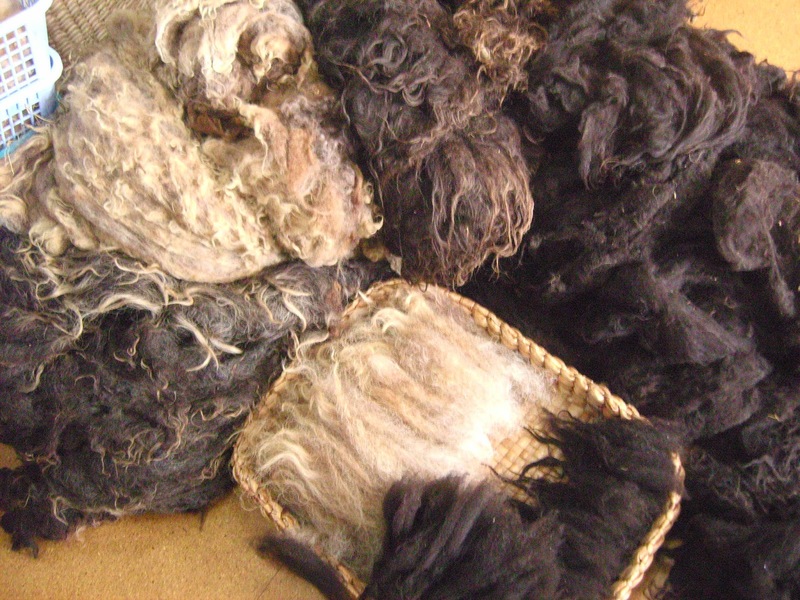 We do 8 picks then add the fleece to make the pile. ....well, we have enough but it was a good excuse. And Sigrid really did want her picture taken! 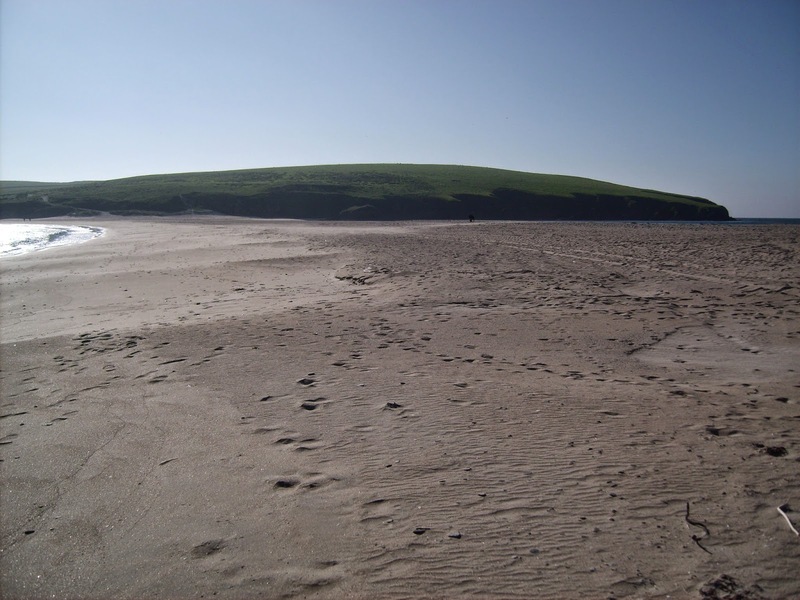 The tombola beach we were on and St. Ninians Isle. Huge amount of sand on the beach this year. 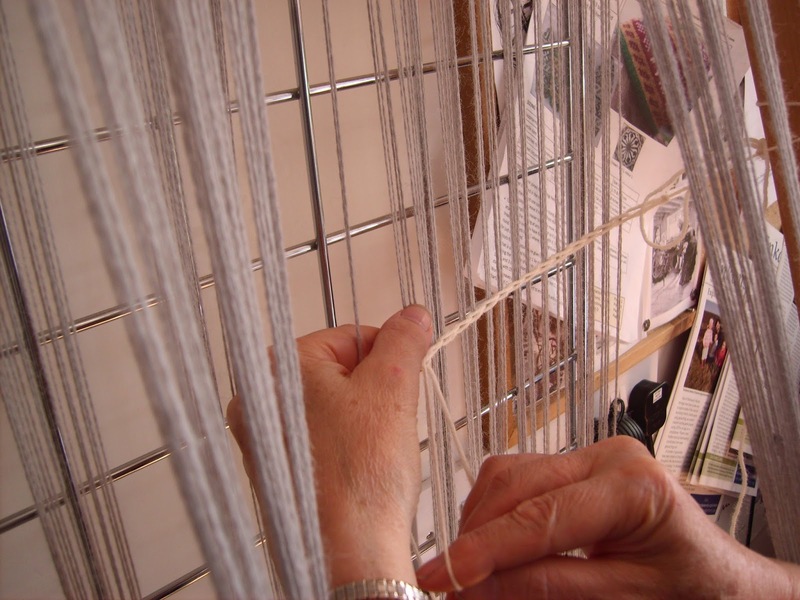 10 cm woven yesterday, and now we have 31 cm woven. Sigrid says 69cm to go. 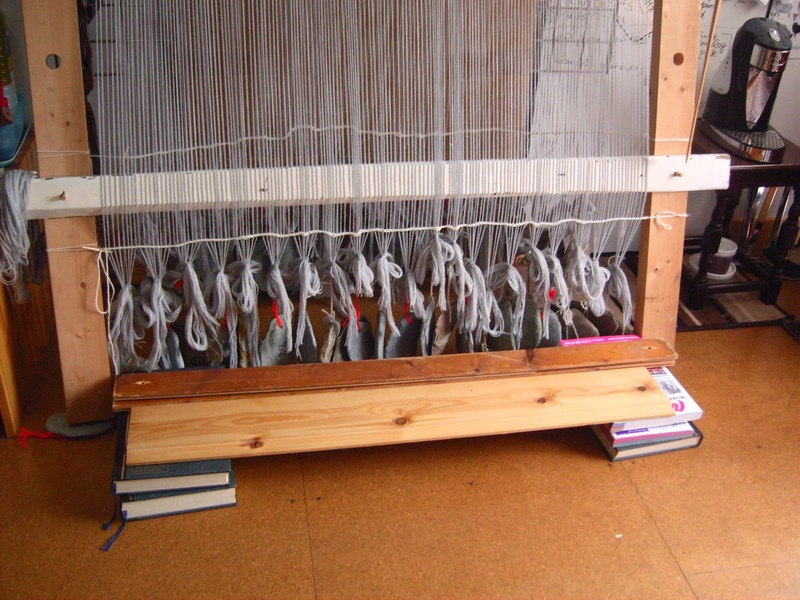 Woven enough so the sides of the weaving needed to be tied to the sides of the loom. Tied over nice bone needles. 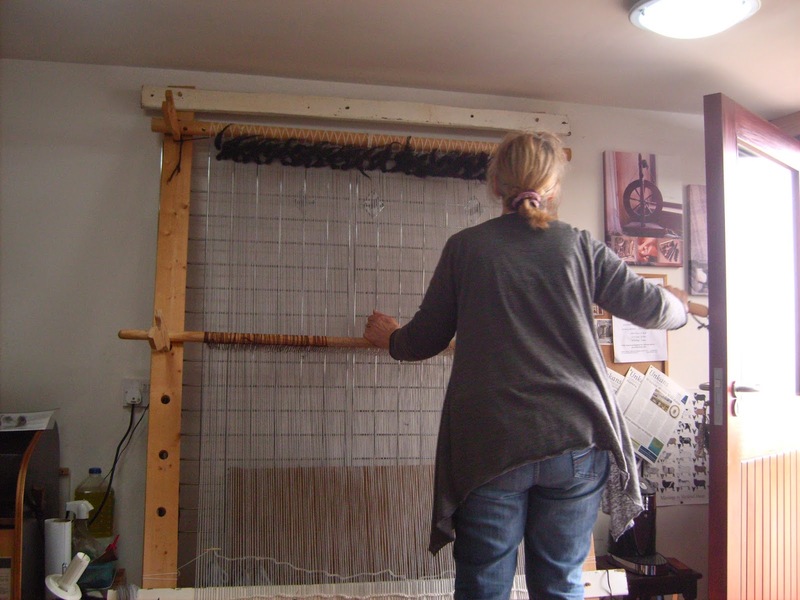 The board we had been standing on to reach the top when we started working could be taken away too and the heddle bar lowered as well. PROGRESS. 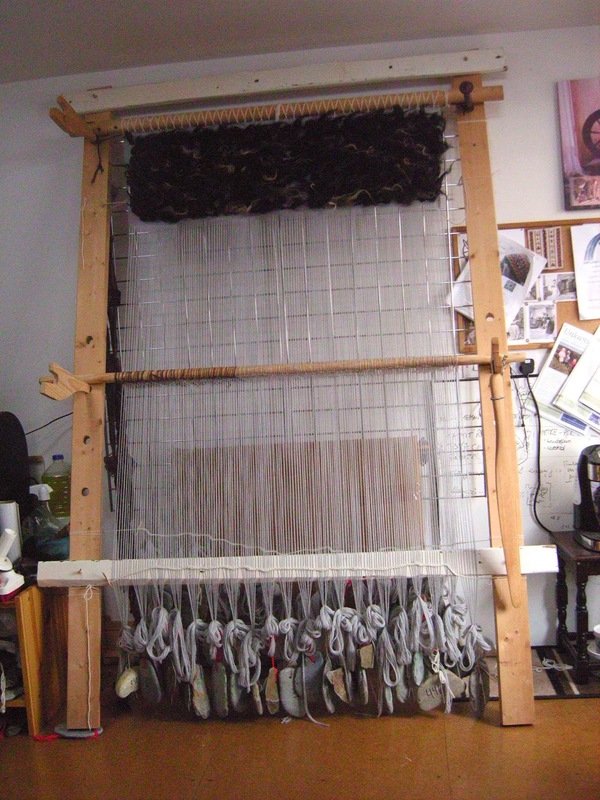 Full view of the loom at the end of today... there is still a lot to weave. 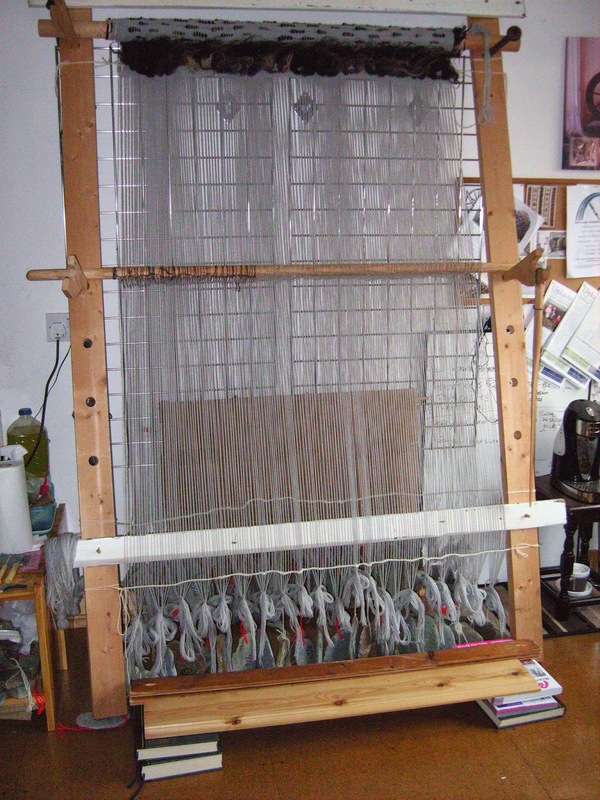 All ready to weave. 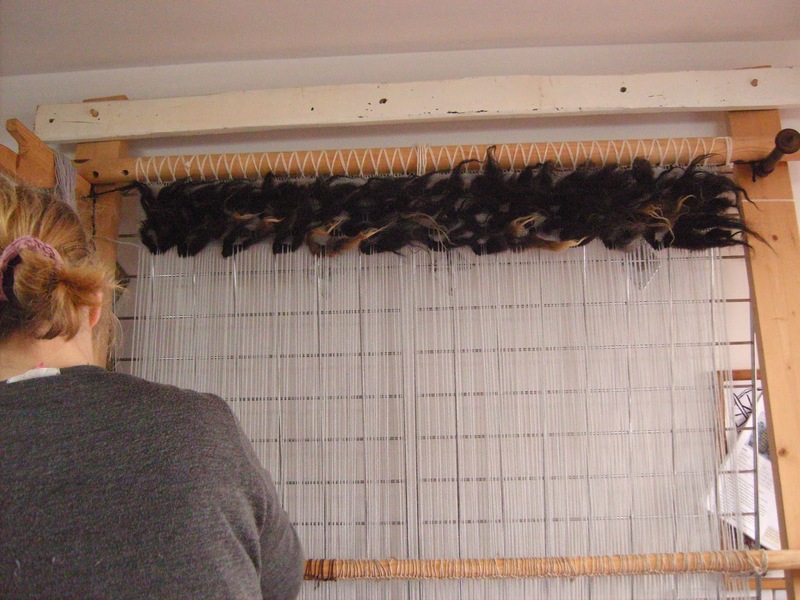 The loom was all set up and the shed tested yesterday, so now we are weaving. Very pleased with the row of stones. They made a beautiful sound as the shed was changed. 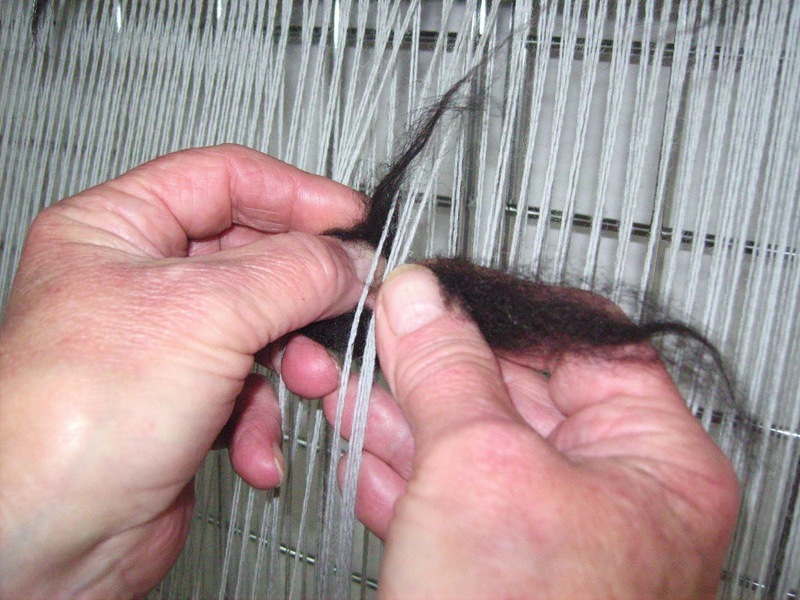 Beating up the first threads on the start of the vararfeldur. 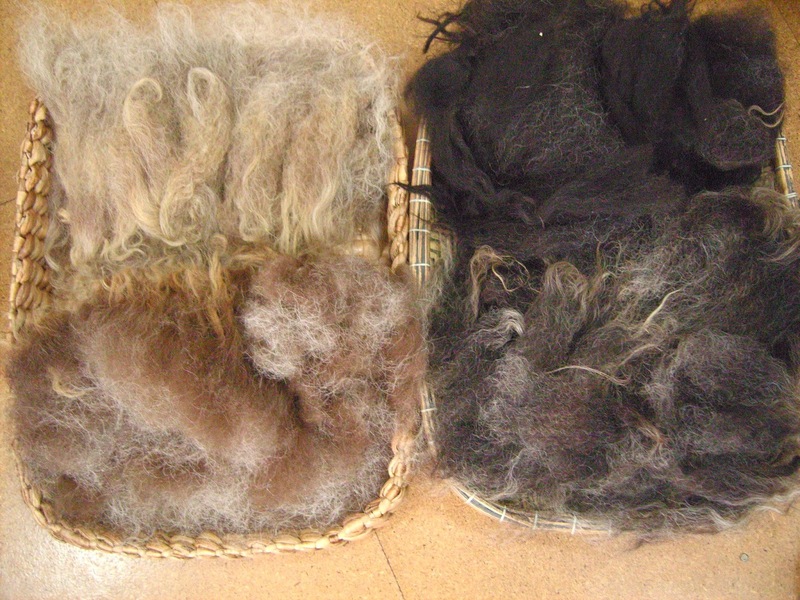 We gave some thought as to how we should use the different coloured fleece in the vararfeldur. We had to try to be artistic! The decision was a frame of black round all 4 edges then mix dark colours for the first part. 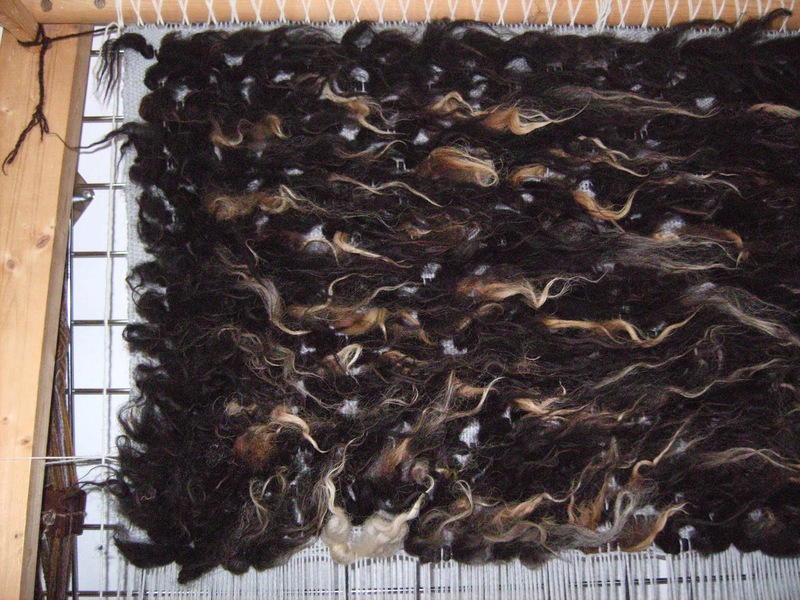 I found some moorit fleece to mix with the black and the grey ....... then see what happens next. 3 rows of pile done in black for an edge to the design. 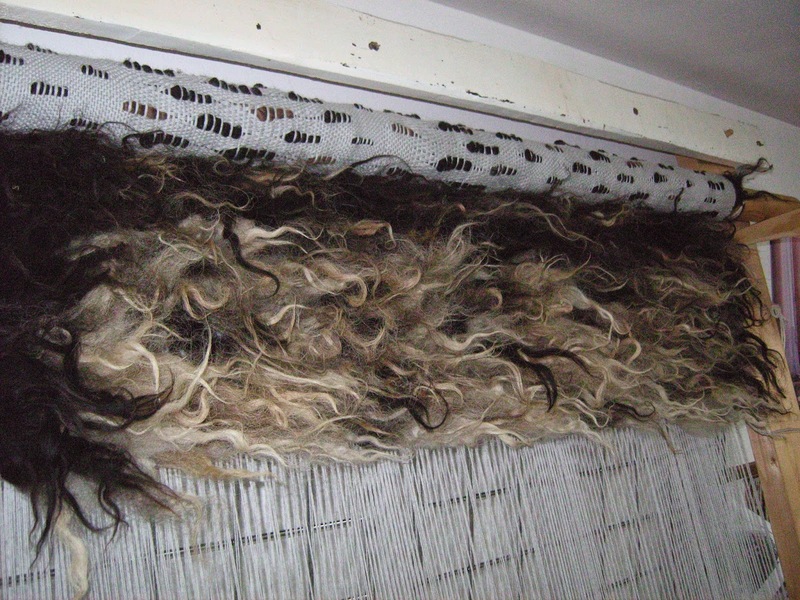 The start of the moorit and grey added in the next 2 rows. Mistake fixed. 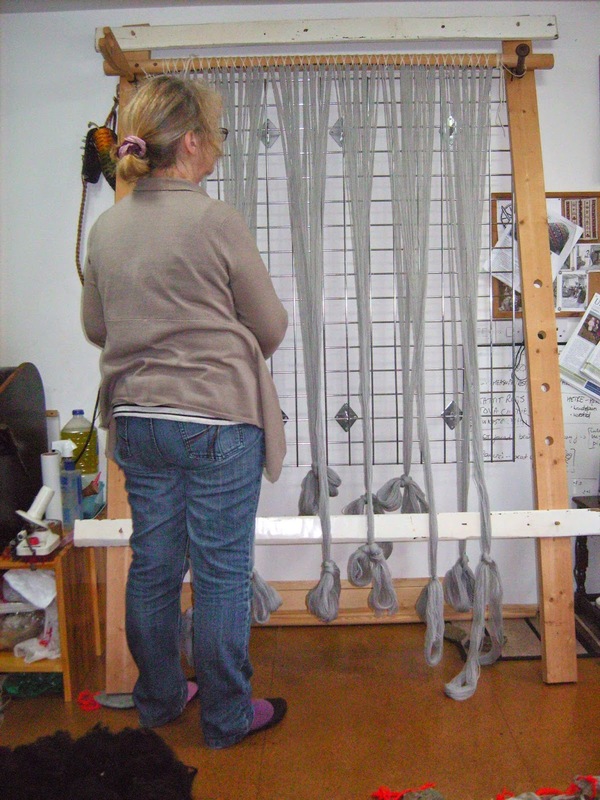 The 8 pairs of threads put in place. Chaining finished. 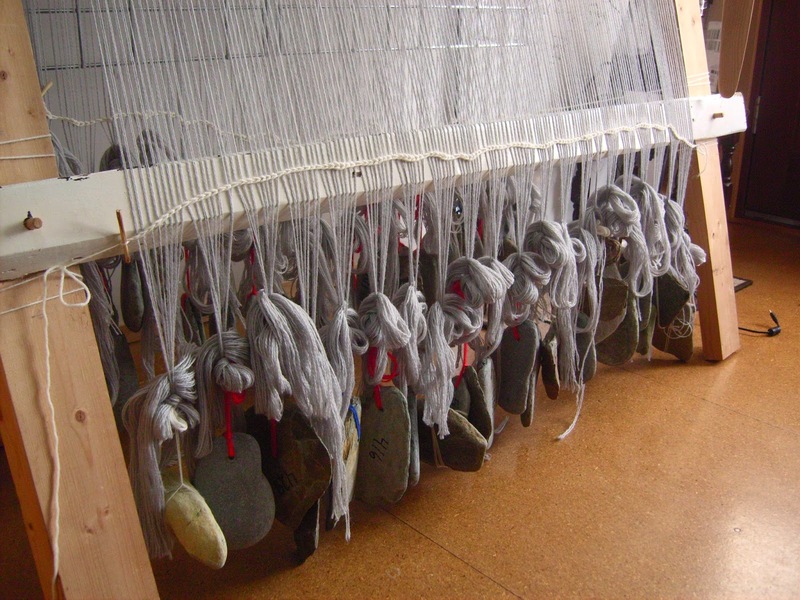 Next was the heddles. 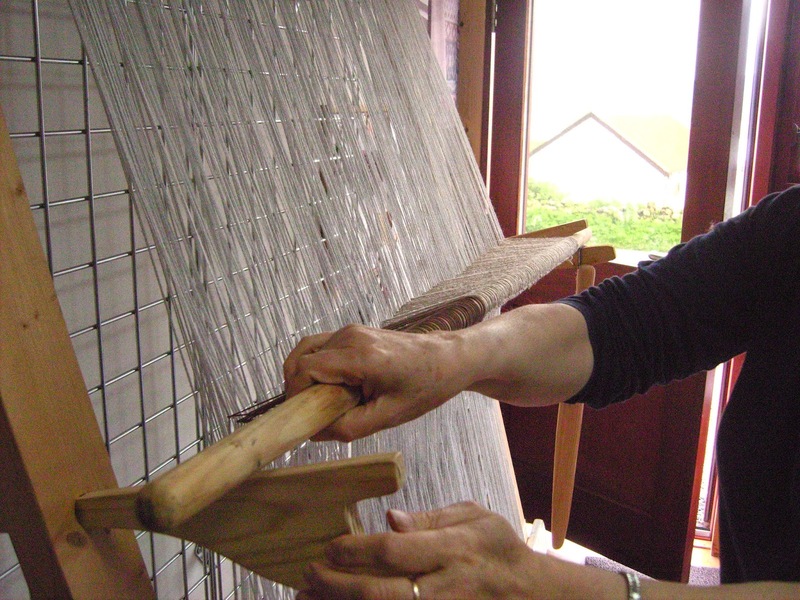 Heddles all finished and time to test that the shed open properly and there are no more mistakes. 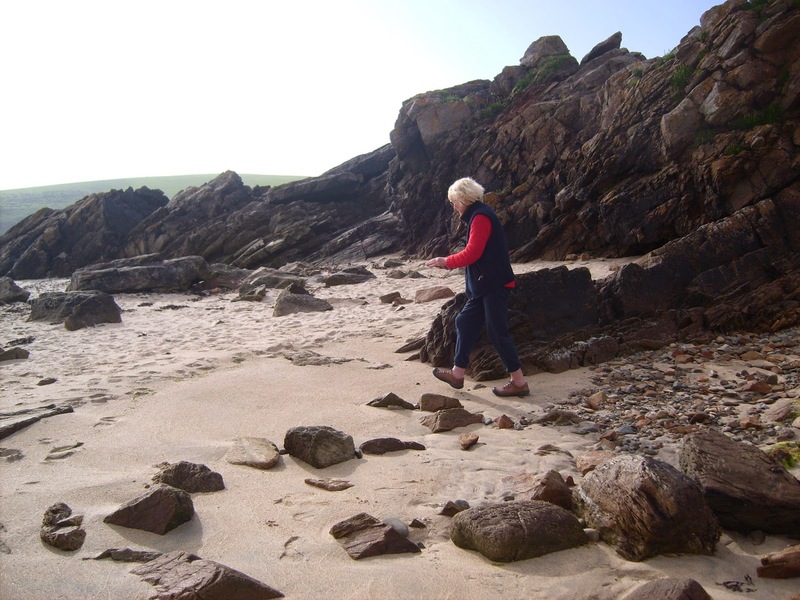 Meanwhile, Sigrid had spent the most of the day (except for the walk on the beach) working on the fleece.